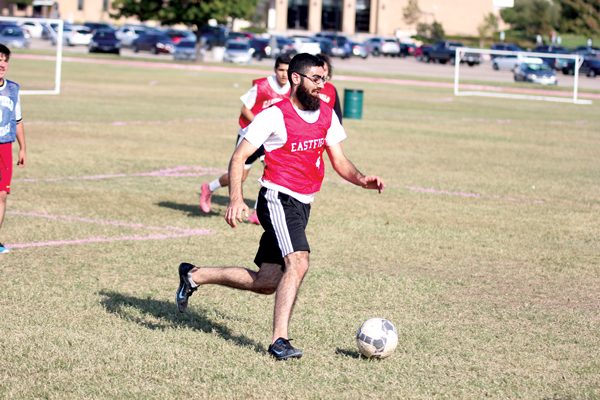 Student Laith Alrdaideh dribbles the ball down the field during a game. Photo by David Sanchez/ The Et Cetera. The Rec Fest intramural sports program has expanded beyond typical basketball and volleyball to include activities such as chess and Zumba. The Office of Student Engagement and Retention is recruiting students into the program through the Eastfield app and new student orientation. Students involved in nonacademic activities are more likely to stay in school, college administrators say. History major Geovaun Andrade signed up for soccer and basketball. “The REC Fest hasn’t necessarily helped me on the academic side of things, but the activities have helped me meet new people,” he said. Activities in the fall included chess and Yu-Gi-Oh tournaments, card games, five-on-five soccer, three-on-three basketball, tennis and Zumba classes. Additional activities are planned for the spring semester. Winners receive customized medals and bigger trophies, and a champions banner will hang in the Pit. Carew, who is in his final semester at the University of Texas at Arlington, said his goal is to enhance the college experience for community college students. “I want you to get a four-year experience for a two-year rate,” Carew said. For information, visit eastfieldcollege.edu/oser/intramural-sports/ or email Carew at jidecarew@dcccd.edu.